In the previous two issues of #LEARNABOUT, we told you all about the edible species of the Solanaceae family. Now it's time to turn to the dark side. The Latin word Solanum means “quieting,” and the Solanaceae family got its name because of the once-thought narcotic properties of some members of the family. As our understanding of the family grew, people discovered that the Solanaceae family not only produces narcotics, but also stimulants, poisons, pain relievers, etc. In this last issue of the three-part series about Solanaceae, we will look at a few plants that are highly poisonous, and the chemicals that make them so. 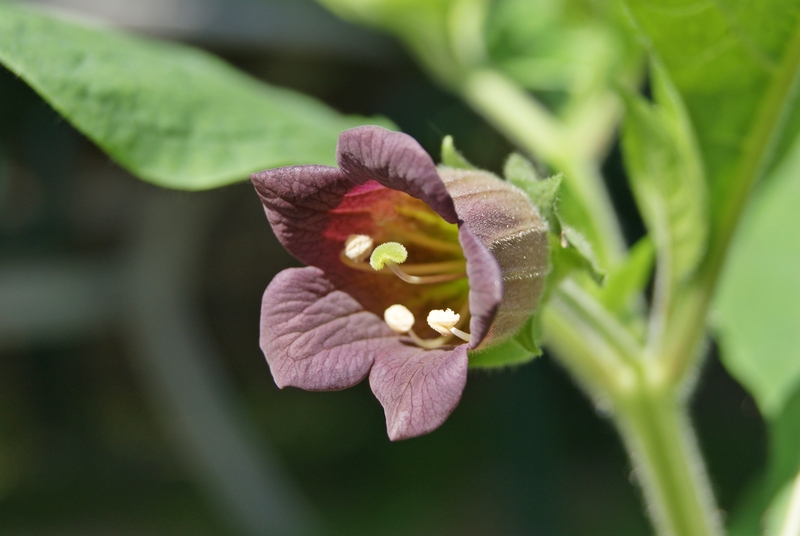 The plant Atropa belladonna, known as deadly nightshade, is how the Solanaceae family got its common name. The genus name Atropa comes from Atropos, one of the Three Fates in Greek mythology, also called "daughters of the night." The name "bella donna" is Italian, meaning "pretty woman," because the plant extract was once used in eye drops by women to dilate their pupils to make them appear more attractive and seductive. Deadly nightshade is one of the most toxic plants found in the Eastern Hemisphere, and the major chemicals that cause it are what we call tropane alkaloids. There are three major tropane alkaloids: scopolamine, hyoscyamine, and atropine, all of which are present in the deadly nightshade. The consumption of two to five berries, or a few leaves by an adult human can be lethal, and those aren't even the most poisonous parts of the plant: the root of the deadly nightshade contains the most tropane alkaloids, and therefore most deadly. The tropane alkaloids act on the human nervous system as cholinergic receptor antagonists (generally speaking, because there are always exceptions). The nervous system uses the neurotransmitter acetylcholine (that act upon cholinergic receptors) to control muscle movements. Tropane alkaloids, as antagonists, will disrupt this process, making muscles unable to contract. More specifically, the tropane alkaloids act on the human body's parasympathetic nervous system, which regulates involuntary movements such as pupillary restriction/dilation, breathing, gastrointestinal movements, and heart rate. So tropane alkaloids will stop most of your muscles from working, from dilating your pupils, to stopping you from breathing. In addition, central nervous system effects of tropane alkaloids include memory disruption, which may lead to severe confusion. The deadly nightshade is also toxic to many domestic animals such as dogs and cats; however, cattle, rabbits, birds and deer eat the plant seemingly without suffering any harmful effects. All of the plants in the Datura genus take on common names such as angel's trumpets or moonflowers. Notably, Datura stramonium, commonly known as thornapple, Jimson weed, and sometimes Devil's snare, is the most common species. The reason that it's called the thornapple is because of its calyx: long and tubular, swollen at the bottom, sharply angled, and surmounted by sharp teeth (thorns). The flowers of the thornapple open at night, emitting a pleasant fragrance, and are fed upon by nocturnal moths. All parts of Datura plants contain dangerous levels of the tropane alkaloids. Despite the danger of the plant, thornapple sometimes has been used as a recreational drug because of the vivid hallucinations and delirium they produce. However, these hallucinations are most commonly described as very unpleasant. My grandma used to tell me a story about how one of her aunts experienced delirium when she accidentally ingested the seeds (mistaking it as the plant Abutilon theophrasti) and took her plow out to the field in the middle of the night and couldn't find home. More curiously, modern researchers have been finding links between mythologies in ancient literature and this hallucinogenic plant. One example is Homer's Odyssey. In one episode in the Odyssey, Odysseus has to rescue his followers from a sorcerer, who turned them into animals, and he was able to do so with a majestic plant he ingested that prevented the sorcerer's spill from working on him. Recent research suggests that the sorcerer actually used Jimson weed/thornapple to cause severe confusion and hallucinations of Odysseus's followers, and the herb that Odysseues ingested was snowdrop (Galanthus nivalis), which has anti-hallucinogenic properties. TED-Ed has a nice animated video on this topic. You can watch it here. Brugmansia is a genus of seven species of flowering plants closely related to Datura, and are sometimes classified under the Datura genus. All seven species are extinct in the wild, but are still grown as ornamental plants. They also take on the common name Angel's trumpet or sometimes Devil's trumpet. Devil or Angel? We do not know. All parts of Brugmansia are poisonous, with the seeds and leaves being especially dangerous. There have also been reports of ingesting Brugmansia for recreational use. However, just like Datura, the hallucinogenic effects of Brugmansia were described as "violent and unpleasant" and causes "sickening aftereffects and temporary insanity." If you are a Harry Potter fan, you are probably no stranger to mandrake. In Harry Potter and the Chamber of Secrets, mandrake is described to look like a human and when mature, its cry can be fatal to any person who hears it. 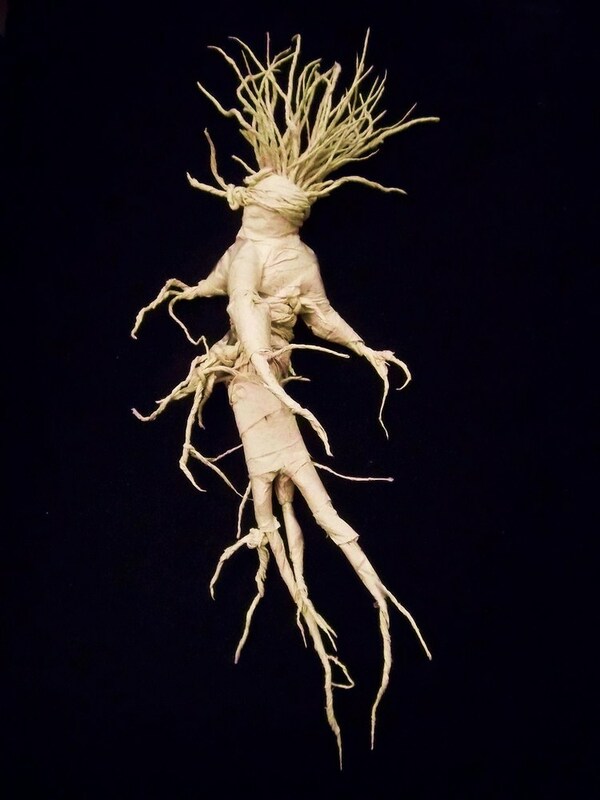 In real life, the genus Mandragora does produce roots (known as mandrakes) that sometimes take on a human body form, and therefore has been incorporated in numerous folklores, literature, and witcheries. One particular folklore states that mandrakes are like humans, and once removed from earth, it will unleash a sharp scream that will kill the collector. So the right way to collect mandrakes is to use a rope, a hunting horn, a starving dog, and a rope. The dog is lured away from the plant, which is tied to the dog's body via the rope. The moment the mandrake is pulled from earth, it will scream. The collector has to cover the scream using the horn, but the dog is too close to the plant and it usually dies. Cruel, isn't it? In medieval times, mandrakes are highly sought after as amulets and potions, and the more resemblance it has to a human figure, the more expensive it gets. Mandrake in Hebrew means “love plant,” used as a cure to sterility. However, there is no evidence that mandrakes affect fertilization. Just like all the other plants we talked about so far, mandrakes contain a large quantity of tropane alkaloids. 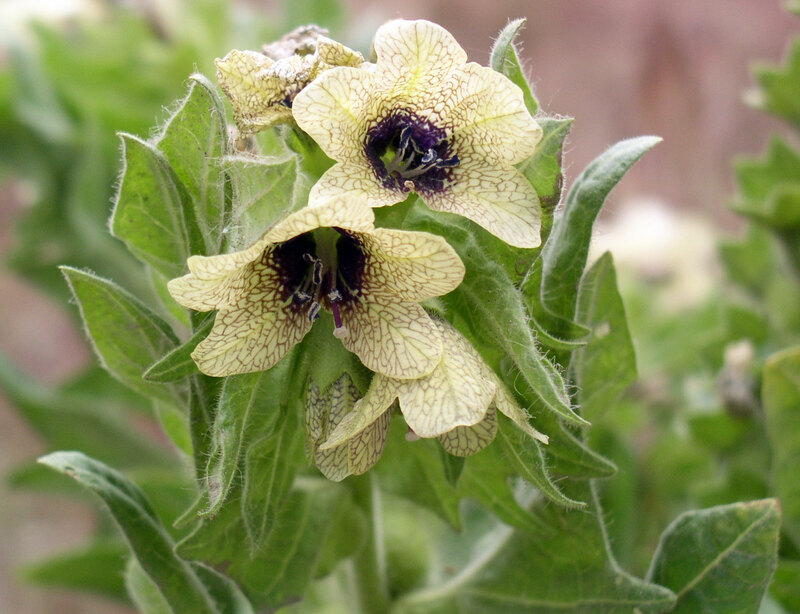 The species Hyoscyamus niger, commonly known as henbane, was historically used in combination with mandrake, deadly nightshade, and datura as an anesthetic potion. It was also known for its psychoactive properties that induce visual hallucinations and a sensation of flight. The name in English means “hen killer,” and in Chinese, the common name translates to "the seeds of Godly fairies." Henbane is so poisonous that the mere smell of the flowers produces giddiness. The cause, of course, is the tropane alkaloids that the plant contains. If you would like to read more about henbanes, here is a scientific review that summarizes the history, description, pharmacology, and toxicology of the plant. We already met the most important member of this genus in Vol 6.2: tobacco, and nicotine is what gives this genus its name. Nicotine is a potent alkaloid and a stimulant drug. 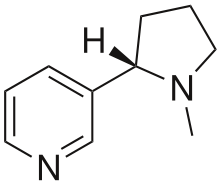 Nicotine's stimulant property is a result of being a nicotinic acetylcholine receptor agonist in the brain, which is completely opposite to tropane alkaloids, which are antagonists. Upon reaching the blood stream and the brain, nicotine causes the brain to release acetylcholine, norepinephrine, epinephrine, vasopressin, serotonin, dopamine, and endorphin, and dopamine acts on the limbic system, the brain's reward center, and causes long-term increase in nicotine demands, which is why nicotine is so highly addictive. It also acts on the liver to release glucose, and on the adrenal medulla to release epinephrine, causing the stimulative effect. We believe that we don't have to tell you all the consequences that comes with nicotine addiction. Even the cigarette packaging says that smoking causes cardiovascular disease, potential birth defects, cancer, and shortened life span. So, one conclusion: you should really quit smoking. We also met this genus in Vol 6.2. Chili peppers, which contain the compound capsaicin, is what gives this genus its name. Capsaicin is structurally unrelated to nicotine and the tropanes. The compound is not appreciably toxic to animals. However, it stimulates specific heat/pain receptors on the tongue in most mammals. This causes a sensation of burning like an actual heat or chemical burn, and that's why spiciness is not a taste but rather a temperature and pain sensation. 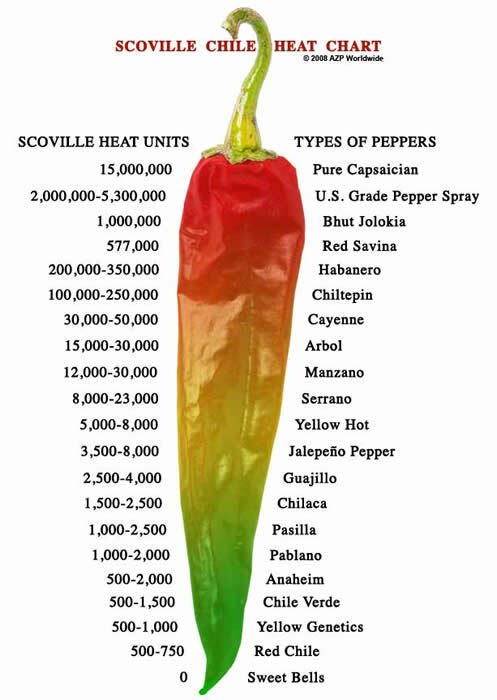 The "hotness" of capsaicin actually has a unit, and it's called the Scoville units. A Scoville unit is the factor by which the capsaicin-containing substance must be diluted to render the resulting solution imperceptible to a tester. Basically, the more Scoville units there are, the spicier the chili pepper gets. It is no secret that milk helps alleviate the burn caused by capsaicin. Why doesn't water help? The short answer is that capsaicin doesn't dissolve in water, but if you want a more detailed answer, check out this article on IFLSCIENCE. Let's come back to the edible nightshades described in our last issue for a moment. However, there is probably truth in the digestive-related disorders, as nightshade sensitivity is definitely real (I have met a few people who are sensitive to nightshades myself). We repeatedly met a chemical called "solanine" in our last issue, and solanine belongs to a larger chemical class called "saponins." Saponins in large doses can cause poisoning, and symptoms are largely displayed by gastrointestinal and neurological disorders such as nausea, diarrhea, vomiting, stomach cramps, burning of the throat, cardiac dysrhythmia, nightmare, headache and dizziness. Another disorder is what's called a "leaky gut," which allows microbes and toxins to enter the blood stream to compromise the immune system, caused by the chemical lectin. It is true that lectins can cause gastrointestinal distress through interaction of the lectins with the epithelial cells of the gut; however, lectin is also abundant in beans, cereal grains, seeds, nuts. So it's a bit unfair to blame the nightshades for this disorder. Modern cultivars of all the edible nightshades contain very little of saponins and lectins. There hasn't been a single case of solanine poisoning due to eating potatoes in the United States for more than 50 years, as the solanine is mostly concentrated in the green leaves and fruits of the potato plant, not the tuber (which is btw the answer to our last issue's guessing game!). There is also an alkaloid called tomatine in tomatoes, and a toxic dose of tomatine for an adult human would require eating at least one pound of tomato leaves. Conclusion: Unless you are one of the very few who has a diagnosed nightshade sensitivity, nightshades are probably not harmful to you. If you find your nightshades in a grocery store, eat away! If you find them on the side of the road, be careful! The tropane alkaloid has gained a bad reputation in this issue. However, I would also like to point out, tropane alkaloid has provided many cheap and reliable medical applications. For example, atropine is used to dilate your pupils in your eye doc's office, and is also used in surgery to prevent bradycardia. Scopolamine is often used in treating spasm of the gastrointestinal tract and motion sickness. Capsaicin is often used as a natural and strong anti-inflammatory and natural antibacterial agent. So you see, a curse can also be a gift if you treat it right!